Iowa's Brandon Scherff received fair warning. He knew this type of scrutiny was coming during the NFL draft buildup. Scherff's offensive line coach, Brian Ferentz, warned him when they made the trip to Orlando for the Outland Trophy, given to the best lineman in college football. Everything, fair or not, would be overanalyzed in the coming months as the Outland winner prepared to be a first-round pick. "You put yourself in a position where you are going to be scrutinized, you're going to be picked apart and people are going to be looking for flaws," Ferentz told Scherff. "It's a very public process." Ferentz's forewarning was legitimate. The nitpicking has been relentless. Are Scherff's arms long enough? Is his technique solid? Does he possess enough athleticism? And, mostly, can he play offensive tackle at the next level? It has been a popular topic to debate. Does Scherff, a left tackle at Iowa, project as a guard or tackle in the NFL? Some don't think there is any doubt. He's "100 percent" a guard, former NFL scout Daniel Jeremiah said recently. Others have chimed in as well. Not everyone agrees, including some of the teams that actually will be making the selections in the first round of the 2015 NFL Draft on April 30. "He's real good. He can play left tackle and be good. He can play right tackle and be great," an NFL scout told NJ Advance Media's Mark Eckel. Others think Scherff can be a good right tackle and a great guard. "Scherff is one of the best run blockers I have seen in a long time. He gouges and finishes. I don't know if he has the frame you want for a left tackle. I graded him as an immediate starter as an offensive guard. He just doesn't have a lot of length. He can climb to the second and even third level and moves fine. I'd feel more comfortable with him at right tackle than left. Plug him in at guard and you might have something special." The Giants are believed to be in the camp that considers Scherff a right tackle or guard. They held a private workout for Scherff several weeks back in Iowa that was attended by offensive line coach Pat Flaherty. There they saw the unique physical ability that likely has many teams believing his game can translate as a tackle playing in space. "OK, length is important. Brandon has fairly long arms. He's 6-4½, he's certainly not a tiny guy. And he has very good athletic ability. He's very explosive. He can cover a lot of ground." Scherff's athleticism really isn't an issue. He ran the 40-yard dash in 5.05 seconds at the NFL Scouting Combine, the fourth-best time among all offensive linemen. He played some quarterback in high school and was a four-year letterman in baseball. His ability to reach the second level and block linebackers is considered a strength. 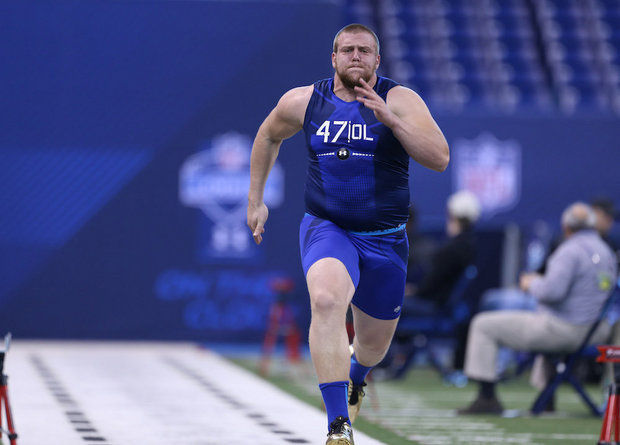 In fact, Scherff's athleticism appears underrated by the public. He is right up there with any of this and last year's draft prospects. "He's a better athlete than both those guys [Zack Martin and Jake Matthews from last year]. A much better athlete," said Ross Tucker, former NFL lineman and current host of The Ross Tucker Football Podcast. "Scherff is up there with [last year's No. 2 pick] Greg Robinson in terms of being an athlete. He's clearly, to me, the best athlete of the guys this year. He just moves so well, so fluid. Looks like a guy who played quarterback or whatever in high school. He gets to the second level and linebackers and it's really, really impressive because it's rare." Those who think Scherff is strictly a guard point to his 2014 game tape. There were some games where he struggled handling speed off the edge. Part of that can likely be attributed to a knee injury suffered early in the season. It limited Scherff, but not to the point where he still isn't very highly regarded. "If you expected him to perform at the level he was performing at when he was 100 percent healthy, probably not," Ferentz said. "Probably not realistic. In my estimation, he didn't perform to the level he's capable of performing at when 100 percent. "But it was still excellent." That's why Scherff is still expected to be a high draft pick, and likely the first offensive lineman off the board come draft day. But more than anything, what Scherff seems to be fighting here is a perception. The reputation is that Iowa offensive linemen coached by Kirk and Brian Ferentz enter the NFL so refined that they're already nearing their ceiling, and their success at the next level is therefore limited. The Iowa tackles are also perceived as non-premium athletes (not the case with Scherff) who must be shifted inside to guard, like Marshal Yanda and Robert Gallery. It's something that the Ferentzes admittedly battle in recruiting. But sometimes, perception can become reality. In this case, that is true because Brian Ferentz has heard it from individuals involved in the draft process. It's out there with Scherff, the latest Iowa lineman who has a high floor but relatively low ceiling. Just because it's out there doesn't necessarily mean it's true. "In my opinion, that is baloney," Brian Ferentz said. "The one thing I know, and I've been fortunate throughout my career to be around some very gifted players, the best players I've been around all wanted to be coached. And they've all wanted to be better. "We've gotten a reputation for producing good offensive linemen. That is flattering. When you look at most of our guys, certainly there are outliers, but one thing they have done despite the reputation is most guys have gone to the National Football League and overachieved in their career. They've played above where they were drafted." Some of the more notable Iowa linemen under Kirk Ferentz include Gallery, Marshal Yanda, Bryan Bulaga and Eric Steinbach. All had lengthy NFL careers. Scherff simply appears to be next in line, whether it be at tackle or guard.